Flowing, easy-to-make canvas curtains do much to soften the hard lines of our double-height room. Linen Roman shades control light while permitting access to views in our family room. 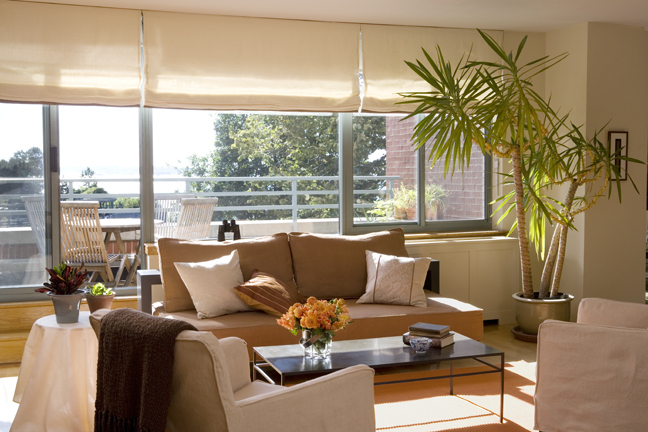 Nothing softens a room and makes it more livable than curtains or shades on the windows. Practical plusses like privacy and light control aside, they bring in layers of color, warmth, and texture that make a room feel complete. Adding curtains and shades to the oversize windows in author Jean Nayar’s New York apartment made it much more comfortable. She designed the cotton canvas curtains and linen shades and made them herself to save money and had pros install them. A believer in the positive impact of soft furnishings on a room, she also wrote a book called Curtains, Covers, Cushions & Blinds (Mitchell Beazley), which shows you how to fabricate various kinds of soft furnishings yourself. If you have basic sewing skills you easily transform your home by making your own window treatments. For inspiration and ideas, consider attending give INSPIRE 2011, the first national Educational Conference and trade show hosted by the Window Coverings Association of America September 7-10 in Louisville, Kentucky. Sarah Richardson, the extremely popular HGTV star, will be the keynote speaker at this 3-day conference. The conference is for professional designers/decorators and sewing artisans—but it also is for people who are interested in ‘shifting’ their careers and becoming window fashions designers or starting their own sewing workroom. Many of WCAA members started out as hobbyists— and built their business from the ground up through educational opportunities like this Conference will provide. Click here to find out more, or visit the WCAA’s Facebook page. Glamourous window treatments designed by a WCAA member add drama to this serene bedroom.